Have You Ever Borrowed Something? And you know, kept it? Yeah, I’m afraid so. I borrowed something and somehow it kept showing back up in my bathroom when I technically no longer need it. I blame the gremlins. Here’s the scoop. My comb went missing for about a day. This is serious as anyone with frizzy and/or curly hair can testify to. I’ve had it for years; how the heck could it go missing? I looked high and low for it as my hair got more knotted and more tangled. My husband looked with no luck and after searching most of the day I gave up. My daughter kindly agreed to let me use her old Suave brush. No good deed goes unpunished. It’s been years since I used a brush because I always preferred to use a comb. My thought was that combs work tangles better and they’re easier to carry. That may be true but a comb does not make your scalp or hair feel the way a good brushing does. What was wrong with me? 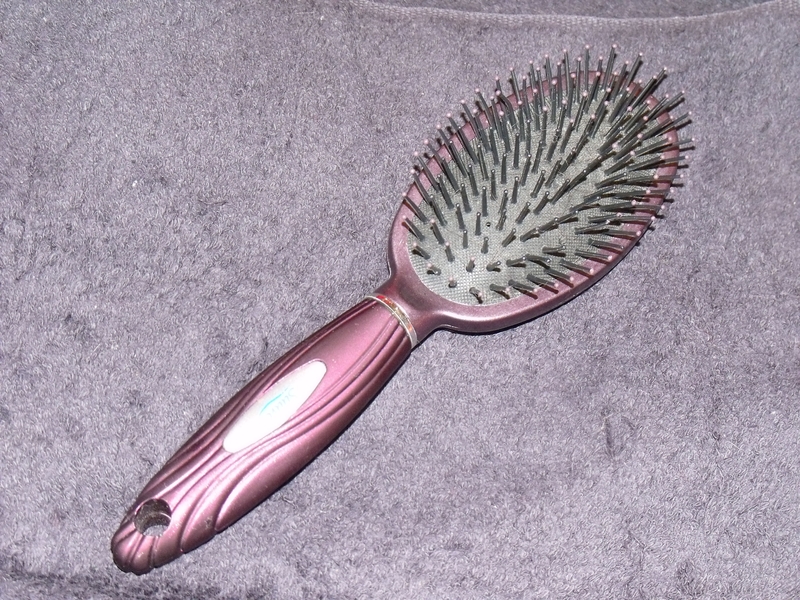 I love, love brushing my hair; long, deep strokes. After a good brush my scalp tingles, my hair is shiny and soft with just a few ripples to make it interesting. I’m afraid I’m addicted. I found the comb stuck in some laundry. How’d it get there? Shrug. Could have been the gremlins, I guess. 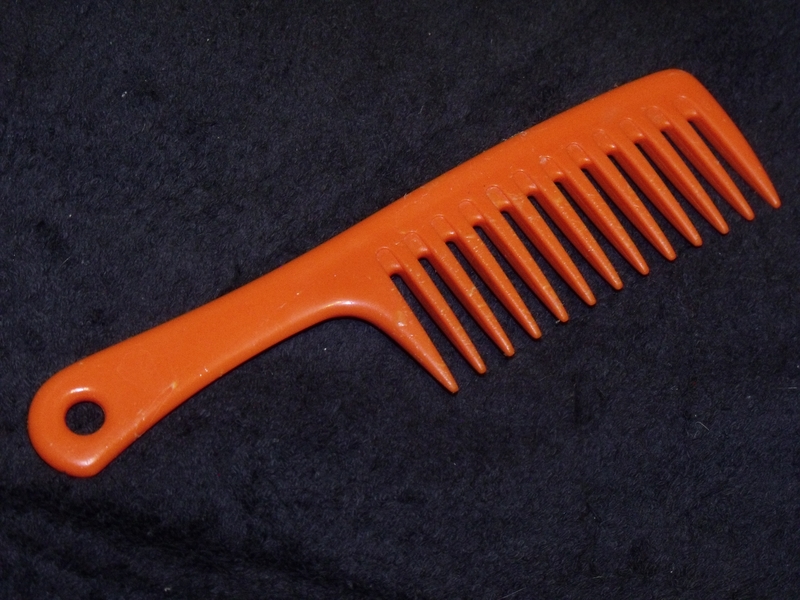 Don’t know but it explains how a large neon-orange comb can go missing. Tracey tried to take her brush back but I…er the gremlins kept sneaking into her bathroom and take it back. Sigh. I knew I needed to buy one but I liked hers and it was fun…umm I mean I fussed about those gremlins moving her brush around. It is not always a good thing to lose something. If it’s your wallet or purse it’s a disaster. At best it’s usually an inconvenience but in this particular case if I had not lost the comb I would not have discovered the simple joy of brushing my hair. Better late than never. I did go buy another brush. It’s a Goody brand that is supposed to help keep the frizz down. I’m told it isn’t working. Oh, well. Tracey let me keep her brush, too. I like it because of the size. Thanks, Tracey! Now I’ve got back up in case those gremlins get active again. Which do you prefer, brushing or combing? What positive experience began with a negative one? Do gremlins live in your home? P.S. Don’t forget the devil may care happenings this Tuesday, June 21 over at #DevilColony on Twitter. Jenny Hansen has been working hard for the party to end all parties. Check out the latest happenings here. Other devil may care parties to visit: Damian Trasler, Shellie Sakai, Tiffany A. White, Writers In The Storm, and Jen Grayson.